The first discovery—a mandible—was made in 1907 by Otto Schoetensack. The skulls of this species share features with both Homo erectus and the anatomically modern Homo sapiens; its brain was nearly as large as that of Homo sapiens. The Sima de los Huesos cave at Atapuerca in northern Spain holds particularly rich layers of deposits where excavations were still in progress as of 2018. Homo sapiens has been proposed as derived from H. heidelbergensis via Homo rhodesiensis, present in East and North Africa from around 400,000 years ago. The correct assignment of many fossils to a particular chronospecies is difficult and often differences in opinion ensue among paleoanthropologists due to the absence of universally accepted dividing lines (autapomorphies) between Homo erectus, Homo heidelbergensis, Homo rhodesiensis and Neanderthals. It is uncertain whether H. heidelbergensis is ancestral to Homo sapiens, as a fossil gap in Africa between 400,000 and 260,000 years ago obscures the presumed derivation of H. sapiens from H. rhodesiensis. Genetic analysis of the Sima de los Huesos fossils (Meyer et al. 2016) seems to suggest that H. heidelbergensis in its entirety should be included in the Neanderthal lineage, as "pre-Neanderthal" or "archaic Neanderthal" or "early Neanderthal", while the divergence time between the Neanderthal and modern lineages has been pushed back to before the emergence of H. heidelbergensis, to about 600,000 to 800,000 years ago, the approximate time of disappearance of Homo antecessor. The delineation between early H. heidelbergensis and H. erectus is also unclear. Given the evidence, it means there is no direct evidence that suggest the Homo heidelbergensis is related to modern-day humans. H. heidelbergensis is thought to be derived from Homo antecessor, around 800,000 to 700,000 years ago. The oldest-known fossil classified as H. heidelbergensis dates to around 600,000 years ago, but the flint tools found in 2005 at Pakefield near Lowestoft in Suffolk with teeth from the water vole Mimomys savini, a key dating species, suggest human presence in England at 700,000 years ago, assumed to correspond to a transitional form between H. antecessor and H. heidelbergensis. Fifty prehistoric hominid footprints up to nearly one million years old were discovered in Happisburgh, England. They are likely members of Homo antecessor that lived from 1.2 million to 800,000 years ago. In Europe, H. heidelbergensis is taken to have given rise to H. neanderthalensis at 240,000 years ago (a conventional date dictated by a fossil gap; late H. heidelbergensis in Europe prior to 240 kya is also called "pre-Neanderthal" or "ante-Neanderthal").Homo sapiens most likely derived from H. rhodesiensis (African H. heidelbergensis) after around 300,000 years ago. A morphological separation of a European and an African branch of H. heidelbergensis during the Wolstonian Stage and Ipswichian Stage, the last of the prolonged Quaternary glacial periods, has been argued[by whom?] based on the evidence of the Atapuerca skull in Spain and the Kabwe skull in modern-day Zambia. Neither the derivation of H. heidelbergensis from H. erectus, nor the derivation of anatomically modern humans and Neanderthals from H. heidelbergensis, are clear-cut and are the object of debate. Both H. erectus and H. heidelbergensis are described as polytypic species, which went through a number of population bottlenecks and associated  In the summary of Hublin (2013), Middle Pleistocene humans in Eurasia underwent a succession of population bottlenecks due to glaciations. The "Western Eurasian clade" derived form H. rhodesiensis or H. heidelbergensis sensu lato (i.e. the Neanderthals) diverge at MIS 12 (480 kya) but coalesce as late as MIS 5 (130 kya), suggesting a division between Eurasian H. heidelbergensis and H. neanderthalensis before MIS 11 (424 kya). A fossil gap in Africa between 400 and 260 kya obscures the presumed derivation of H. sapiens from H. rhodesiensis. For more than half a century, many experts were reluctant to accept Homo heidelbergensis as a separate taxon due to the rarity of specimens, which prevented sufficient informative morphological comparisons and the distinction of H. heidelbergensis from other known human species. The species name "heidelbergensis" only experienced a renaissance with the many discoveries of Middle Pleistocene fossils since the 1990s. The paleontology institute at Heidelberg University, where the type specimen is kept since 1908, as late as 2010 still classified it as Homo erectus heidelbergensis, i.e. categorizing it as a Homo erectus subspecies. This was reportedly changed to Homo heidelbergensis, accepting the categorization as separate species, in 2015. "Rhodesian Man" (Kabwe 1) is now mostly classified as Homo heidelbergensis, though other designations such as Homo sapiens arcaicus and Homo sapiens rhodesiensis have also been proposed. White et al. (2003) suggested Rhodesian Man as ancestral to Homo sapiens idaltu (Herto Man). Homo heidelbergensis is intermediate between Homo erectus and Homo neanderthalensis, with a typical cranial volume of approximately 1,250 cm3 (76 cu in). "The anatomy [of H. heidelbergensis] is clearly more primitive than that of Neanderthal, but the harmoniously rounded dental arch and the complete row of teeth...already typically human." In general, the findings show a continuation of evolutionary trends that are emerging from around the Lower into Middle Pleistocene. Along with changes in the robustness of cranial and dental features, a remarkable increase in brain size from H. erectus towards H. heidelbergensis is noticeable. Male H. heidelbergensis averaged about 1.75 m (5 ft 9 in) tall and 62 kg (136 lb). Females averaged 1.57 m (5 ft 2 in) and 51 kg (112 lb). A reconstruction of 27 complete human limb bones found in Atapuerca (Burgos, Spain) has helped to determine the height of H. heidelbergensis compared with H. neanderthalensis; the conclusion was that these H. heidelbergensis averaged about 170 cm (5 ft 7in) in height and were only slightly taller than Neanderthals. The "nature of our object" reveals itself "at first sight" since "a certain disproportion between the jaw and the teeth" is obvious: "The teeth are too small for the bone. The available space would allow for a far greater flexibility of development" and "It shows a combination of features, which has been previously found neither on a recent nor a fossil human mandible. Even the scholar should not be blamed if he would only reluctantly accept it as human: Entirely missing is the one feature, which is regarded as particularly human, namely an outer projection of the chin portion, yet this deficiency is found to be combined with extremely strange dimensions of the mandibular body. The actual proof that we are dealing with human parts here only lies within the nature of the dentition. The completely preserved teeth bear the stamp 'human' as evidence: The canines show no trace of a stronger expression in relation to the other groups of teeth. They suggest a moderate and harmonious co-evolution, as it is the case in recent humans." Discoveries in a pit in Atapuerca (Spain) of 28 human skeletons suggest that H. heidelbergensis might have been the first species of the genus Homo to bury its dead. The morphology of the outer and middle ear suggests they had an auditory sensitivity similar to modern humans. They were probably able to differentiate between many different sounds. Dental wear analysis suggests they were as likely to be right-handed as modern people.Steven Mithen believes that H. heidelbergensis, like its descendant H. neanderthalensis, acquired a pre-linguistic system of communication. No forms of art have been uncovered, although red ochre, a mineral that can be used to mix a red pigment which is useful as a paint, has been found at Terra Amata excavations in the south of France. An archeological site in Schöningen, Germany contained eight exceptionally well-preserved roughly-400,000-year-old spears for hunting, and various other wooden tools. 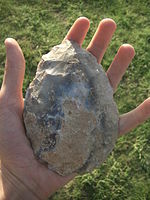 Five-hundred-thousand-year-old hafted stone points used for hunting are reported from Kathu Pan 1 in South Africa, tested by way of use-wear replication. This find could mean that modern humans and Neanderthals inherited the stone-tipped spear, rather than developing the technology independently. The Schöningen spears are eight wooden throwing spears, dated to before 300,000 years ago, discovered between 1994 and 1998 in the open-cast lignite mine, in Schöningen, county Helmstedt, Germany, together with thousands of animal bones. They are regarded as the direct evidence for active hunting by H. heidelbergensis (pre-Neanderthals). Mauer 1, the first fossil discovery of this species, was found on 21 October 1907, at Mauer, near Heidelberg, Germany. However, it was not until 1908 that the discovery gained traction among public interest. It is a jaw in good condition except for the missing premolar teeth, which were eventually found near the jaw. Otto Schoetensack, from the University of Heidelberg, identified and named the fossil. The next H. heidelbergensis remains were found in Steinheim an der Murr, Germany (the Steinheim skull, 350kya), Arago, France (Arago 21), Petralona, Greece, and Ciampate del Diavolo, Italy. Boxgrove Man is the name associated with a lower tibia discovered in 1994 at the Boxgrove Quarry site, close to the English Channel. The fossil was found along with hundreds of hand axes, and has been dated between 478,000 and 524,000 years old. Several H. heidelbergensis teeth were found at the same site in subsequent seasons. A complete cranium (skull 5), nicknamed Miguelón, and fragments of other crania, such as skull 4, nicknamed Agamemnón and skull 6, nicknamed Rui (from El Cid, a local hero). Nearby sites contain the only known and controversial Homo antecessor fossils. There is current debate among scholars whether the remains at Sima de los Huesos are those of H. heidelbergensis or early H. neanderthalensis. In 2015, the study of mitochondrial DNA samples from three caves Sima de los Huesos revealed that they are "distantly related to the mitochondrial DNA of Denisovans rather than to that of Neanderthals." In 2016 nuclear DNA analysis determined the Sima hominins are Neanderthals and not Denisova hominins, and the divergence between Neanderthals, Denisovans and anatomically modern humans predates 430,000 years ago. Recent studies have hypothesized that homo sapiens and Neanderthals separated from the Homo heidelbergensis branch. They also proposed that "[a]s there are potential H. heidelbergensis fossils from Asia, it is possible they could represent the ancestors of the Denisovans." It has been suggested that Homo rhodesiensis be merged into this article. (Discuss) Proposed since August 2018. A number of morphologically-comparable fossil remains came to light in East Africa (Bodo, Ndutu, Eyasi, Ileret) and North Africa (Salé, Rabat, Dar-es-Soltane, Djbel Irhoud, Sidi Aberrahaman, Tighenif) during the 20th century. The Saldanha cranium, found in 1953 in South Africa was subject to at least three taxonomic revisions from 1955 to 1996. 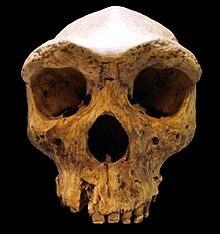 Kabwe 1, also called the Broken Hill skull, was assigned by Arthur Smith Woodward in 1921 as the type specimen for Homo rhodesiensis; it is today mostly assigned to Homo heidelbergensis. It was found in a lead and zinc mine in Broken Hill, Northern Rhodesia (now Kabwe, Zambia) in 1921 by Tom Zwiglaar, a Swiss miner. In addition to the cranium, an upper jaw from another individual, a sacrum, a tibia, and two femur fragments were also found. The skull was dubbed "Rhodesian Man" at the time of the find, but is now commonly referred to as the Broken Hill skull or the Kabwe cranium. Cranial capacity of the Broken Hill skull has been estimated at 1,230 cm3 (75 cu in). Bada, & al., (1974) published the direct date of 110 ka for this specimen measured by aspartic acid racemization. The destruction of the paleoanthropological site has made layered dating impossible. The skull suggests an extremely robust individual with the comparatively largest brow-ridges of any known hominin. It was described as having a broad face similar to that of Homo neanderthalensis (i.e. large nasal bones and thick protruding brow ridges). Consequently, researchers came up with interpretations such as "African Neanderthal". However, with regard to the skull's extreme robustness, recent research has highlighted several intermediate features between modern Homo sapiens and Neanderthal. The skull has cavities in ten of the upper teeth and is considered one of the oldest known occurrences of cavities. Pitting indicates significant infection before death and implies that the cause of death may have been due to dental disease infection or possibly chronic ear infection. The skull is kept in the Natural History Museum, London. There is a replica in the Museum in Livingstone, Zambia. The 600,000-year-old Bodo cranium was found in 1976 by members of an expedition led by Jon Kalb at Bodo D'ar in the Awash River valley of Ethiopia. The initial discovery—a lower face—was made by Alemayhew Asfaw and Charles Smart. Two weeks later, Paul Whitehead and Craig Wood found the upper portion of the face. The skull is 600,000 years old. Although the skull is most similar to those of Kabwe, Woodward's nomenclature was discontinued and its discoverers attributed it to H. heidelbergensis. It has features that represent a transition between Homo ergaster/erectus and Homo sapiens. Another specimen, "the hominid from Lake Ndutu" in northern Tanzania, around 400,000 years old. In 1976 R. J. Clarke classified it as Homo erectus and it has generally been viewed as such since, although points of similarity to H. sapiens have also been recognized. After comparative studies with similar finds in Africa allocation to an African subspecies of H. sapiens seems most appropriate. An indirect cranial capacity estimate suggests 1,100 ml (39 imp fl oz; 37 US fl oz). Its supratoral sulcus morphology and the presence of protuberance as suggested by Philip Rightmire "give the Nudutu occiput an appearance which is also unlike that of Homo erectus", but Stinger (1986) pointed out that a thickened iliac pillar is typical for Homo erectus. In a 1989 publication Clarke concludes: "It is assigned to archaic Homo sapiens on the basis of its expanded parietal and occipital regions of the brain". The Saldanha cranium, or Elandsfontein cranium, are fossilized remains later identified as Homo heidelbergensis, found in 1954 in Elandsfontein, located in the Hopefield of South Africa. The Homo heidelbergensis has been indicated as an ancestor of modern humans that did not have air sacs. It is said that the loss of air sacs contributed to humans' ability to develop further in vocal language. Ancestors, such as the Australopithecus, did not have air sacs. Furthermore, evidence has shown that Homo heidelbergensis were right-handed. Right-handedness is associated with the development of language among hominins. Considering this evidence, scientist have hypothesized about the speaking capabilities of the species. A recent study, that compared the speech frequency of humans and chimpanzees, reported that the Homo heidelbergensis speech abilities most resemble that of modern-day humans. More specifically, "the Atapuerca SH hominins show[ed] a bandwidth that [wa]s slightly displaced and considerably extended to encompass the frequencies that contain relevant acoustic information in human speech." The Homo heidelbergensis is home to many firsts for the human species. It has been noted by the Smithsonian National Museum of Natural History to be the first species of the homo genus branch to build permanent shelters. Furthermore, the physical build of the Homo heidlebergensis allowed it to be the first of the homo genus to withstand colder temperatures, paving the way for its successors to evolve to withstand even colder landscapes. The ratio of height to width, with a wide body in comparison to height, is what enabled the species to conserve more body heat to endure harsher climates. It has also been proposed by scientists that the Homo heidelbergensis was the first to contract odontogenic orbital cellulitis, or a severe eye infection, that developed from an abscess in the mouth. The "Galilee skull", found in 1925/6 at Mugharet el-Zuttiyeh, now in Israel, has been described as "the most likely Heidelberg candidate from Western Asia". Petralona 1, discovered in Petralona cave, Greece, in 1960, dated to between roughly 350,000 and 150,000 years old. It has been classified as either H. heidelbergensis or H. neanderthalensis. Tautavel Man (Arago 21) is a human skull discovered on 22 July 1971 near the village of Tautavel in Pyrénées-Orientales, dated at 450,000 years old. The fossil was classified as Homo erectus tautavelensis, and as such would not belong to H. heidelbergensis but to a different lineage of H. erectus which occupied Europe at the same time as H. heidelbergensis. Avery, D. Margaret. 2018. "Micromammals from the Type Site of Broken Hill Man (Homo Rhodesiensis) near Kabwe, Zambia: A Historical Note." Historical Biology 30 (1–2): 276–83. https://doi.org/10.1080/08912963.2017.1297434. Friess, Martin. 2010. "Calvarial Shape Variation among Middle Pleistocene Hominins: An Application of Surface Scanning in Palaeoanthropology." Comptes Rendus Palevol, Imaging & 3D in palaeontology and palaeoanthropology, 9 (6): 435–43. https://doi.org/10.1016/j.crpv.2010.07.016. Godinho, Ricardo Miguel, Laura C. Fitton, Viviana Toro-Ibacache, Chris B. Stringer, Rodrigo S. Lacruz, Timothy G. Bromage, and Paul O'Higgins. 2018. "The Biting Performance of Homo Sapiens and Homo Heidelbergensis." Journal of Human Evolution 118 (May): 56–71. https://doi.org/10.1016/j.jhevol.2018.02.010. Hublin, Jean-Jacques, Abdelouahed Ben-Ncer, Shara E. Bailey, Sarah E. Freidline, Simon Neubauer, Matthew M. Skinner, Inga Bergmann, et al. 2017. "New Fossils from Jebel Irhoud, Morocco and the Pan-African Origin of Homo Sapiens." Nature 546 (7657): 289–92. https://doi.org/10.1038/nature22336. Murrill, Rupert Ivan (1981). Ed. Charles C. Thomas, ed. Petralona Man. A Descriptive and Comparative Study, with New Information on Rhodesian Man. Springfield, Illinois: Thomas. ISBN 978-0-398-04550-0. Perner, Josef, and Frank Esken. 2015. "Evolution of Human Cooperation in Homo Heidelbergensis: Teleology versus Mentalism." Developmental Review, Theories of development, 38 (December): 69–88. https://doi.org/10.1016/j.dr.2015.07.005. Singer Robert R. and J. Wymer (1968). "Archaeological Investigation at the Saldanha Skull Site in South Africa". The South African Archaeological Bulletin. 23 (3): 63–73. doi:10.2307/3888485. JSTOR 3888485. Weinert, Hans (1937). "Dem Unterkiefer von Mauer zur 30jährigen Wiederkehr seiner Entdeckung". Zeitschrift für Morphologie und Anthropologie (in German). 37 (1): 102–13. JSTOR 25749563. Woodward, Arthur Smith (1921). "A New Cave Man from Rhodesia, South Africa". Nature. 108 (2716): 371–372. Bibcode:1921Natur.108..371W. doi:10.1038/108371a0. ^ H. heidelbergensis likely speciated into H. sapiens and H. neanderthalensis before c. 250 ka, but late survival of H. heidelbergensis in Africa is suggested by the tentative dating of Kabwe 1, the type specimen of H. rhodesiensis, at 110 ka. ^ The fossil range spans about 0.6 to 0.4 Ma; cladistically, H. heidelbergensis is estimated to have developed from H. erectus (or H. antecessor) around 0.8–0.7 Ma, and given rise to H. neanderthalensis (and, via H. rhodesiensis, possibly H. sapiens) around 0.4–0.3 Ma. ^ Manzi, Giorgio (2016-08-08). "Humans of the Middle Pleistocene: The controversial calvarium from Ceprano (Italy) and its significance for the origin and variability of Homo heidelbergensis". Quaternary International. 411: 254–261. doi:10.1016/j.quaint.2015.12.047. ISSN 1040-6182. ^ a b c Buck, Laura T.; Stringer, Chris B. (2014-03-17). "Homo heidelbergensis". Current Biology. 24 (6): R214–R215. doi:10.1016/j.cub.2013.12.048. ISSN 0960-9822. PMID 24650901. ^ Kjærgaard, Peter C. (2014-04-29). "Inventing Homo gardarensis: Prestige, Pressure, and Human Evolution in Interwar Scandinavia". Science in Context. 27 (2): 359–383. doi:10.1017/s0269889714000106. ISSN 0269-8897. ^ "Homo heidelbergensis (600,000 to 100,000 years ago)- Species Description". WGBH Educational Foundation and Clear Blue Sky Productions, Inc. Retrieved November 29, 2015. ^ "Archaeological Site of Atapuerca". UNESCO World Heritage Centre. Retrieved November 29, 2018. ^ "Homo heidelbergensis". Natural History Museum, London. Retrieved 18 March 2013. ^ "Homo heidelbergensis: Evolutionary Tree information". Smithsonian National Museum of Natural History. 2010-02-14. Retrieved 18 March 2013. ^ a b Mounier, Aurélien; Marchal, François; Condemi, Silvana (2009). "Is Homo heidelbergensis a distinct species? New insight on the Mauer mandible". Journal of Human Evolution. 56 (3): 219–46. doi:10.1016/j.jhevol.2008.12.006. PMID 19249816. ^ "Der Homo heidelbergensis - Vor etwa 700 000 Jahren taucht der Homo heidelbergensis in Afrika auf und wandert dann über eine noch unbekannte Route ebenfalls nach Europa aus..." Homo heidelbergensis von Mauer e.V. Retrieved November 29, 2015. ^ Lenton, Tim; Watson, Andrew J. (20 January 2011). Revolutions that Made the Earth. Oxford University Press. p. 364. ISBN 978-0-19-958704-9. Retrieved 7 February 2018. ^ Dusseldorp, Gerrit Leendert (2009). A View to a Kill: Investigating Middle Palaeolithic Subsistence Using an Optimal Foraging Perspective. Sidestone Press. p. 14. ISBN 978-90-8890-020-4. Retrieved 7 February 2018. ^ Minelli, Alessandro; Contrafatto, Giancarlo (10 November 2009). BIOLOGICAL SCIENCE FUNDAMENTALS AND SYSTEMATICS - Volume IV. EOLSS Publications. p. 248. ISBN 978-1-84826-189-1. Retrieved 7 February 2018. ^ "Prehistoric World Hominid Chronology by Peter Kessler Homo neanderthalis". Kessler Associates. July 26, 2005. Retrieved December 9, 2015. ^ "What was Homo heidelbergensis? - DNA studies on both species indicate that the two were certainly distinct from each other, although related through their common Homo heidelbergensis ancestors". InnovateUs Inc. Retrieved November 29, 2015. ^ a b Hublin, J.-J. (2013), "The Middle Pleistocene Record. On the Origin of Neandertals, Modern Humans and Others" in: R. David Begun (ed. ), A Companion to Paleoanthropology, John Wiley, pp. 517-537 (summary 529–531). "Most, if not all, of the African specimens assigned to H. rhodesiensis (cf heidelbergensis) seem to predate the divergence between H. neanderthalensis and H. sapiens. However, a gap in the fossil record, possibly between 400 and 260 ka, blurs the transition or punctuation event that separated H. rhodesiensis and H. sapiens." (p. 532). ^ "Homo heidelbergensis - The evolutionary dividing line between Homo erectus and modern humans was not sharp". Dennis O'Neil. Retrieved November 29, 2015. ^ Lieberman, Daniel E.; McBratney, Brandeis M.; Krovitz, Gail (2002). "The evolution and development of cranial form" (PDF). Proceedings of the National Academy of Sciences. 99 (3): 1134–1139. Bibcode:2002PNAS...99.1134L. doi:10.1073/pnas.022440799. PMC 122156. PMID 11805284. Retrieved December 9, 2015. ^ Parfitt, Simon A.; Barendregt, René W.; Breda, Marzia; Candy, Ian; Collins, Matthew J.; Coope, G. Russell; Durbidge, Paul; Field, Mike H.; Lee, Jonathan R. (2005). "The earliest record of human activity in northern Europe". Nature. 438 (7070): 1008–12. Bibcode:2005Natur.438.1008P. doi:10.1038/nature04227. PMID 16355223. ^ Roebroeks, Wil (2005). "Archaeology: Life on the Costa del Cromer". Nature. 438 (7070): 921–2. Bibcode:2005Natur.438..921R. doi:10.1038/438921a. PMID 16355198. ^ Parfitt, Simon; Stuart, Tony; Stringer, Chris; Preece, Richard (January–February 2006). "700,000 years old: found in Suffolk". British Archaeology. 86. Archived from the original on 2013-09-28. ^ Kinver, Mark (14 December 2005). "Tools unlock secrets of early man". BBC News. Retrieved November 16, 2012. ^ D. Dean; J.-J. Hublin; R. Holloway; R. Ziegler (1998). "On the phylogenetic position of the pre-Neandertal specimen from Reilingen, Germany". Journal of Human Evolution. 34 (5). pp. 485–508. doi:10.1006/jhev.1998.0214. ^ "Homo heidelbergensis - Homo heidelbergensis began to develop regional differences that eventually gave rise to two species of humans". Australian Museum. Retrieved October 29, 2015. ^ "the picture emerging is one of Homo erectus as a widespread, polytypic species, with groups persisting longer in some regions than in others. The pattern documented in China and especially in Java contrasts with that in the West, where Homo erectus seems to disappear from the record at a relatively early date". "Human Evolution in the Middle Pleistocene: The Role of Homo heidelbergensis by G. Philip Rightmire" (PDF). Instytut Archeologii Uniwersytetu Warszawskiego. Retrieved November 30, 2015. ^ Stringer, Chris (2012). "Comment: What makes a modern human". Nature. 485 (7396): 33–35 . Bibcode:2012Natur.485...33S. doi:10.1038/485033a. PMID 22552077. ^ "The  fossils’ identity suddenly became complicated when a study of the maternally inherited mitochondrial DNA (mtDNA) from one of the bones revealed that it did not resemble that of a Neanderthal. Instead, it more closely matched the mtDNA of a Denisovan...". "DNA from Neandertal relative may shake up human family tree". American Association for the Advancement of Science. September 11, 2015. Retrieved November 29, 2015. “Indeed, the Sima de los Huesos specimens are early Neanderthals or related to early Neanderthals,” after his team had scanned this DNA for markers found only in Neanderthals, Denisovans or modern humans, they found that the nuclear genomes of those specimens were significantly more similar to Neanderthals. "And that suggests the Neanderthal-Denisovan split happened before 430,000 years ago". "Researchers Sequenced 430,000-Year-Old DNA From Neanderthal Relative". IFLScience. September 13, 2015. Retrieved November 29, 2015. ^ McHenry, Henry. "Homo heidelbergensis". Encyclopaedia Britannica. Retrieved 2017-11-10. Until the 1990s it was common to place these specimens either in H. erectus or into a broad category along with Neanderthals that was often called archaic H. sapiens. ^ Mounier, M Aurélien (October 28, 2009). "Homo heidelbergensis is supported as a valid taxon. - Validité du taxon Homo heidelbergensis Schoetensack, 1908" (PDF). Université de la Méditerranée - Faculté de Médicine de Marseille. Retrieved 2017-11-10. ^ "Die Evolution des Menschen - Homo heidelbergensis" (in German). evolution-mensch.de. Retrieved 2017-11-10. ^ "Hierzu zählte noch im Jahr 2010 auch das Geologisch-Paläontologische Institut der Universität Heidelberg, das den Unterkiefer seit 1908 verwahrt und ihn als Homo erectus heidelbergensis auswies. Inzwischen wird er jedoch auch in Heidelberg als Homo heidelbergensis bezeichnet, siehe". Sammlung des Instituts für Geowissenschaften. Retrieved November 29, 2015. ^ White, Tim D.; Asfaw, B.; DeGusta, D.; Gilbert, H.; Richards, G. D.; Suwa, G.; Howell, F. C. (2003). "Pleistocene Homo sapiens from Middle Awash, Ethiopia". Nature. 423 (6491): 742–747. Bibcode:2003Natur.423..742W. doi:10.1038/nature01669. PMID 12802332 Asfaw, Berhane (2005). "A new hominid parietal from Bodo, middle Awash Valley, Ethiopia". American Journal of Physical Anthropology. 61 (3): 367–371. doi:10.1002/ajpa.1330610311. PMID 6412559. ^ Dorey, Fran (2017-09-25). "Homo heidelbergensis - Key physical features". Australian Museum. Retrieved 2017-11-10. ^ Johanna Kontny u. a.: Reisetagebuch eines Fossils. In: Günther A. Wagner u. a., S. 44. ^ "Die Evolution des Menschen - Homo heidelbergensis - Die Tatsache, dass es keine klaren Übergänge zu geben scheint, macht es schwierig, eine Liste eindeutiger Merkmale des Homo heidelbergensis aufzustellen..." evolution-mensch de. Retrieved November 29, 2015. ^ "Evolution of Modern Humans: Homo heidelbergensis". Behavioral Sciences Department, Palomar College. Retrieved 2012-12-01. ^ "Homo heidelbergensis was only slightly taller than the Neanderthal". American Association for the Advancement of Science (AAAS). June 6, 2012. Retrieved November 29, 2015. ^ Carretero, José-Miguel; Rodríguez, Laura; García-González, Rebeca; Arsuaga, Juan-Luis; Gómez-Olivencia, Asier; Lorenzo, Carlos; Bonmatí, Alejandro; Gracia, Ana; Martínez, Ignacio (2012). "Stature estimation from complete long bones in the Middle Pleistocene humans from the Sima de los Huesos, Sierra de Atapuerca (Spain)" (PDF). Journal of Human Evolution. 62 (2): 242–55. doi:10.1016/j.jhevol.2011.11.004. PMID 22196156. Lay summary – ScienceDaily (June 6, 2012). ^ Burger, Lee (November 2007). "Our Story: Human Ancestor Fossils". The Naked Scientists. ^ "Homo heidelbergensis essay". Institute of Human Origins. Retrieved October 29, 2015. ^ "Scientists Determine Height of Homo Heidelbergensis". Sci-News. June 6, 2012. Retrieved November 29, 2015. ^ "100 years of Homo heidelbergensis – life and times of a controversial taxon" (PDF). Max Planck Institute for Evolutionary Anthropology. Archived from the original (PDF) on March 4, 2016. Retrieved December 9, 2015. ^ The Mystery of the Pit of Bones, Atapuerca, Spain: Species Homo heidelbergensis. Smithsonian Institution. Retrieved December 15, 2011. "Homo heidelbergensis - Eudald Carboneli et al. reported in the March 27, 2008 issue of Nature that a human jaw with a tooth dating 1.2-1.1 million years ago has been found in Sima del Elefante cave in the Atapuerca Mountains of Northern Spain". palomar.edu. Retrieved October 29, 2015. ^ Martínez I, Rosa M, Arsuaga JL, Jarabo P, Quam R, Lorenzo C, Gracia A, Carretero JM, Bermúdez de Castro JM (2004). "Auditory capacities in Middle Pleistocene humans from the Sierra de Atapuerca in Spain". Proceedings of the National Academy of Sciences. 101 (27): 9976–81. Bibcode:2004PNAS..101.9976M. doi:10.1073/pnas.0403595101. JSTOR 3372572. PMC 454200. PMID 15213327. ^ Lozano, Marina; Mosquera, Marina; De Castro, José María Bermúdez; Arsuaga, Juan Luis; Carbonell, Eudald (2009). "Right handedness of Homo heidelbergensis from Sima de los Huesos (Atapuerca, Spain) 500,000 years ago". Evolution and Human Behavior. 30 (5): 369–76. doi:10.1016/j.evolhumbehav.2009.03.001. ^ a b Wilkins, Jayne; Schoville, Benjamin J.; Brown, Kyle S.; Chazan, Michael (2012). "Evidence for Early Hafted Hunting Technology" (PDF). Science. 338 (6109): 942–6. Bibcode:2012Sci...338..942W. doi:10.1126/science.1227608. PMID 23161998. Lay summary – The Guardian (November 15, 2012). ^ "Homo heidelbergensis Oldest Wooden Spear". Smithsonian Institution. Retrieved October 29, 2015. ^ "OU Libraries Authentication Service". academic-eb-com.ezproxy.lib.ou.edu. Retrieved 2018-11-17. ^ Streeter et al. 2001, Margret (2001). "Histomorphometric age assessment of the Boxgrove 1 tibial diaphysis". Journal of Human Evolution. 40 (4): 331–338. doi:10.1006/jhev.2001.0460. PMID 11312585. Retrieved 22 March 2015. ^ a b "BBC - Science & Nature - The evolution of man". ^ "Sorry, that's a dead link - Natural History Museum". ^ "Nuclear DNA sequences from the hominin remains of Sima de los Huesos, Atapuerca, Spain // 5TH ANNUAL MEETING OF THE European Society for the study of Human Evolution, 10 – 12 SEPTEMBER 2015 LONDON/UK: Nuclear DNA sequences from the hominin" (PDF). ^ magazine, Ewen Callaway, Nature. "Oldest Ancient-Human DNA Details Dawn of Neandertals". Scientific American. Retrieved 2016-03-14. ^ Meyer, Matthias; Arsuaga, Juan-Luis; de Filippo, Cesare; Nagel, Sarah; Aximu-Petri, Ayinuer; Nickel, Birgit; Martínez, Ignacio; Gracia, Ana; de Castro, José María Bermúdez (2016-03-14). "Nuclear DNA sequences from the Middle Pleistocene Sima de los Huesos hominins". Nature. 531 (7595): 504–507. Bibcode:2016Natur.531..504M. doi:10.1038/nature17405. ISSN 1476-4687. PMID 26976447. ^ Wood, Bernard (2011-03-31). Wiley-Blackwell Encyclopedia of Human Evolution, 2 Volume Set. ISBN 9781444342475. Retrieved December 9, 2015. ^ "Kabwe 1". The Smithsonian Institution's Human Origin Program. 2010-01-30. Retrieved 2 November 2010. ^ Begun, David R., ed. (2012). "The African Origin of Homo sapiens". A Companion to Paleoanthropology. John Wiley & Sons. ISBN 9781118332375. ^ Bada, J. L. (1985). "Amino Acid Racemization Dating of Fossil Bones". Annual Review of Earth and Planetary Sciences. 13: 241–268. doi:10.1146/annurev.ea.13.050185.001325. ^ "Collections - Natural History Museum". www.nhm.ac.uk. ^ "Bodo Skull and Jaw". Skulls Unlimited. Retrieved 15 October 2012. ^ "Bodo". Humanorigins.si.edu. 2010-01-30. Retrieved 15 October 2012. ^ "Meet Bodo and Herto There is some discussion around the species assigned to Bodo". Nutcracker Man. April 7, 2015. Retrieved December 9, 2015. ^ Singer, R (September 1954). "The saldanha skull from hopefield, South Africa". American Journal of Physical Anthropology. 12 (3): 345–362. doi:10.1002/ajpa.1330120309. PMID 13207329. ^ De Boer, Bart (2012-01-01). "Loss of air sacs improved hominin speech abilities". Journal of Human Evolution. 62 (1): 1–6. doi:10.1016/j.jhevol.2011.07.007. ISSN 0047-2484. PMID 22078314. ^ Lozano, Marina; Mosquera, Marina; De Castro, José María Bermúdez; Arsuaga, Juan Luis; Carbonell, Eudald (2009-09-01). "Right handedness of Homo heidelbergensis from Sima de los Huesos (Atapuerca, Spain) 500,000 years ago". Evolution and Human Behavior. 30 (5): 369–376. doi:10.1016/j.evolhumbehav.2009.03.001. ISSN 1090-5138. ^ Martínez, I.; Rosa, M.; Quam, R.; Jarabo, P.; Lorenzo, C.; Bonmatí, A.; Gómez-Olivencia, A.; Gracia, A.; Arsuaga, J.L. (2013-05-08). "Communicative capacities in Middle Pleistocene humans from the Sierra de Atapuerca in Spain". Quaternary International. 295: 94–101. doi:10.1016/j.quaint.2012.07.001. ISSN 1040-6182. ^ Gracia-Téllez, Ana; Arsuaga, Juan-Luis; Martínez, Ignacio; Martín-Francés, Laura; Martinón-Torres, María; Bermúdez De Castro, José-María; Bonmatí, Alejandro; Lira, Jaime (2013-05-08). "Orofacial pathology in Homo heidelbergensis: The case of Skull 5 from the Sima de los Huesos site (Atapuerca, Spain)". Quaternary International. 295: 83–93. doi:10.1016/j.quaint.2012.02.005. ISSN 1040-6182. ^ a b "Homo heidelbergensis". The Smithsonian Institution's Human Origins Program. 2010-02-14. Retrieved 2018-11-17. ^ Wroe, Stephen; Parr, William C. H.; Ledogar, Justin A.; Bourke, Jason; Evans, Samuel P.; Fiorenza, Luca; Benazzi, Stefano; Hublin, Jean-Jacques; Stringer, Chris (2018-04-11). "Computer simulations show that Neanderthal facial morphology represents adaptation to cold and high energy demands, but not heavy biting". Proc. R. Soc. B. 285 (1876): 20180085. doi:10.1098/rspb.2018.0085. ISSN 0962-8452. PMC 5904316. PMID 29618551. ^ DeCroos, FC; Liao, JC; Ramey, NA; Li, I (2011-08-15). "Management of Odontogenic Orbital Cellulitis". Journal of Medicine and Life. 4 (3): 314–317. ISSN 1844-122X. PMC 3168817. PMID 22567060. ^ Ascaso, F.; Adiego, M.I. (2016-09-14). "Homo heidelbergensis: the oldest case of odontogenic orbital cellulitis?". Acta Ophthalmologica. 94. doi:10.1111/j.1755-3768.2016.0022. ISSN 1755-375X. ^ Cartmill, Matt; Smith, Fred H. (2009). The Human Lineage. John Wiley & Sons. ISBN 978-0471214915. Retrieved 2013-03-01. ^ "Petralona 1". Smithsonian Institution. Retrieved November 29, 2015. ^ "Tautavel Man". Saissac. Retrieved November 29, 2015. ^ Avery, D. Margaret (March 2017). "Micromammals from the type site of Broken Hill Man (Homo rhodesiensis) near Kabwe, Zambia: a historical note". Historical Biology. 30 (1–2): 276–283. doi:10.1080/08912963.2017.1297434. ISSN 0891-2963. ^ Friess, Martin (2010-09-01). "Calvarial shape variation among Middle Pleistocene hominins: An application of surface scanning in palaeoanthropology". Comptes Rendus Palevol. 9 (6–7): 435–443. doi:10.1016/j.crpv.2010.07.016. ISSN 1631-0683. ^ Godinho, Ricardo Miguel; Fitton, Laura C.; Toro-Ibacache, Viviana; Stringer, Chris B.; Lacruz, Rodrigo S.; Bromage, Timothy G.; O'Higgins, Paul (2018-05-01). "The biting performance of Homo sapiens and Homo heidelbergensis". Journal of Human Evolution. 118: 56–71. doi:10.1016/j.jhevol.2018.02.010. ISSN 0047-2484. PMID 29606203. ^ Perner, Josef; Esken, Frank (2015-12-01). "Evolution of human cooperation in Homo heidelbergensis: Teleology versus mentalism". Developmental Review. 38: 69–88. doi:10.1016/j.dr.2015.07.005. ISSN 0273-2297. Wikisource has the text of the 1920 Encyclopedia Americana article Heidelberg Man. "Kabwe 1". The Smithsonian Institution's Human Origin Program. 2010-01-30. Retrieved 2 November 2010.